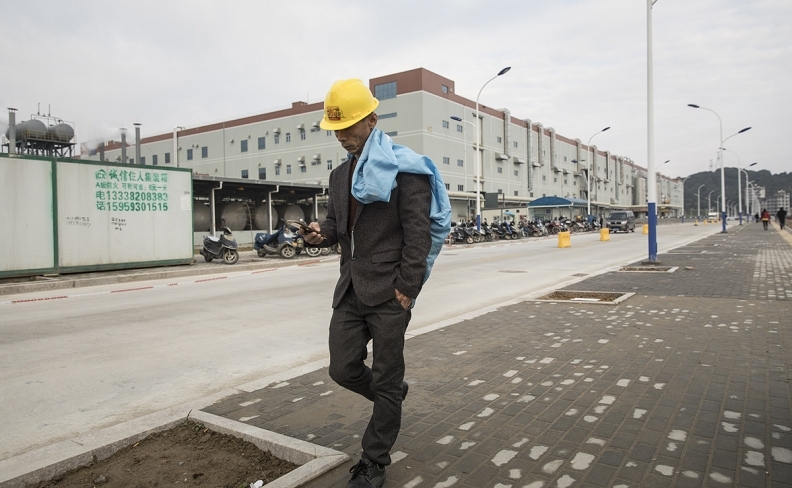 New global player CATL sets EV battery sights on Europe, U.S.
A worker walks past the CATL manufacturing complex in Ningde. The isolated city is surrounded by mountains, with a long history of fishing and farming that has more recently made way for a few Starbucks and McDonald's locations. The next global powerhouse in the auto industry comes from a small city in a tea-growing province of southeast China, where an unheralded maker of electric-vehicle batteries is planning a $1.3 billion (8.2 billion yuan) factory with enough capacity to surpass the output of Tesla and dwarf the suppliers for battery-powered cars by GM, Nissan and Audi. Contemporary Amperex Technology, or CATL, already sells the most batteries to the biggest electric-vehicle makers in the biggest EV market: China. Now it wants to use proceeds from a pending initial public offering backed by Goldman Sachs Group to get under the hoods of more European marques and secure customers in the U.S. The company plans to raise $2 billion as soon as this year by selling a 10 percent stake, at a valuation of about $20 billion. The share sale would finance construction of a battery-cell plant second in size only to Tesla’s gigafactory in Nevada -- big enough to cement China as the leader in the technology replacing gas-guzzling engines. The new assembly lines would quintuple CATL’s production capability and make it the world’s largest electric-vehicle battery cell manufacturer, ahead of Tesla, Warren Buffett-backed BYD in China and South Korea’s LG Chem, according to Bloomberg New Energy Finance. The factory could go fully online as soon as 2020, an opportune time as China targets a sevenfold increase in new-energy vehicle sales by 2025 and ponders a course for phasing out fossil-fuel vehicles altogether. China’s government likes to have national champions of industry: think Alibaba Group Holding in e-commerce and Tencent Holdings in social media. So far no automakers are part of that conversation, although CATL is working its way in there by capitalizing on China’s push for cleaner air and fewer oil imports. The rising battery giant is, in no small part, a manifestation of China’s aggressive government support for electric vehicles. China surpassed the U.S. in 2015 to become the world’s biggest market for EVs. Sales of new-energy vehicles -- including battery-powered, plug-in hybrid and fuel-cell vehicles -- reached 777,000 units last year and could surpass 1 million this year, the China Association of Automobile Manufacturers estimated. In China, the source of 99 percent of CATL’s business, the company's lithium ion batteries will be inside locally made EVs from Volkswagen, BMW, and Hyundai Toyota, Honda and Nissan are considering CATL batteries for planned China-made vehicles. Domestic companies using the batteries include BAIC Motor, the biggest EV seller in China, and Zhengzhou Yutong Group, the world’s biggest bus maker. CATL is already in the midst of expanding overseas. Last year, it spent 30 million euros ($35 million then) to acquire 22 percent of Finland’s Valmet Automotive Oy, a contract manufacturer for Daimler’s Mercedes-Benz and supplier to Porsche and Volkswagen’s Lamborghini. CATL also added offices in Paris to existing facilities across Germany. The company has a partnership with BMW’s motorsport teams for races in Europe and Macau, splashing its blue logo across the carmaker’s M6 GT3. Now CATL is making another leap. Job ads for positions in the Detroit area have appeared on LinkedIn, and the company said in an email it is meeting with several U.S. automakers to discuss partnerships. Ningde doesn’t look like a global foundry for the key technology inside the cars of the future. The isolated city is surrounded by mountains, with a long history of fishing and farming that has more recently made way for a few Starbucks and McDonald’s locations. President Xi Jinping apprenticed there as a Communist Party chief in the 1980s, when Ningde was the poorest city on China’s east coast. Menahem Anderman, president of Total Battery Consulting, in Petaluma, California, went to see CATL’s headquarters for himself in January and found a company in the process of becoming a world-class battery maker. The new battery plant is set to rise on landfilled mudflats across a lake from CATL’s sprawling headquarters. The entire complex, all barely seven years old, is vast enough that it takes half an hour to walk from an office building on the northwest corner to a gate on the east side. Six electric shuttle buses, all powered by CATL batteries, trundle employees between dormitories, factories and research labs. For the 90-minute trip to the nearest airport in Fuzhou, employees can book free chauffeured rides in a Zinoro hybrid built by BMW's joint venture and powered by CATL batteries. Zeng Yuqun, the 49-year-old engineer who founded CATL, is often seen walking fast across the campus. He was born in a mountain village an hour away and sometimes organizes employee excursions to his birthplace. For most of his career, he worked on lithium ion batteries for consumer electronics, including the iPhone, at Amperex Technology, or ATL, a subsidiary of Japan’s TDK that he helped found. Zeng’s decision to start CATL in 2011, while he was president of ATL, marked a gamble on the direction of Chinese government policy. That year there were just 1,014 alternative-energy vehicles sold in China, according to Bloomberg Intelligence. Zeng’s prediction proved right: Xi’s administration now provides generous incentives for consumers buying non-gasoline vehicles. In 2016 and 2017, those subsidies may have totaled 83 billion yuan ($13 billion), according to an estimate from Cui Dongshu, secretary-general of the China Passenger Car Association. Automakers seeking to qualify choose domestic battery suppliers because of concerns that models built with foreign brands will be ineligible, even though there isn’t a written rule banning non-Chinese suppliers. “The premise is that locally produced cars in China are obligated to use local batteries,” Jochem Heizmann, CEO of Volkswagen Group China, said in January. Zeng proceeded to use an allegory to caution workers against complacency. “Is the pig really flying? What happened to the pig after the typhoon is gone?” he wrote, according to the company’s WeChat account. The pig is the company, the strong winds are government subsidies, and the danger is that favorable policies won’t always be there to provide uplift. CATL reaps further benefits from an aggressive government policy to acquire the minerals needed for battery makers. China is securing supplies of key materials such as lithium, nickel and rare earths, and its mining companies are estimated to be responsible for 62 percent of the global supply of cobalt, the Cleveland-based Institute for Energy Economics and Financial Analysis said in a January report. The upcoming IPO should propel CATL to become the biggest lithium-ion battery cell maker in the world. The company previously forecast sales of as much as 100 billion yuan by 2020, a huge jump from 14.9 billion yuan in its last full-year earnings from 2016. The company’s ramp-up, in turn, will extend China’s grip on global battery production to about 70 percent of the market by 2021, up from 54 percent last year, according to BNEF. That startling growth has some overseas origins. “Their technological background and procedures are quite good, partly because they have some history with a Japanese company,” said Mark Newman, a senior research analyst with Sanford C. Bernstein in Hong Kong. There’s also German engineering in its DNA. In 2011, CATL was chosen by BMW and local partner Brilliance China Automotive Holdings to supply their domestic premium EV brand, Zinoro. Last year, the German automaker hosted a coming-out party for its plug-in hybrid model, the 60H, amid coconut trees on the resort island of Hainan. Johann Wieland, president of the Chinese joint venture, and Zeng stood side-by-side to pose for photos with the silver model. Helping power the growth is a strong r&d effort, said Zhou Lei, a Tokyo-based partner covering the auto industry for Deloitte Tohmatsu Consulting. CATL has ties to institutes in Germany and State College, Pennsylvania, according to its website. CATL spent 670 million yuan on research during the first half of last year, or about 11 percent of revenue, according to its prospectus. BYD, China's largest maker of NEVs, spent 2.76 billion yuan, or 6 percent of revenue, according to the company. Research-and-development staff comprise a fifth of CATL’s 18,000-plus workforce, and the company plans to use 4.2 billion yuan from the IPO to develop next-generation batteries, it said. The share sale, which suggests a valuation of about $20 billion, would potentially make CATL one of the biggest listed companies on China’s Nasdaq-style ChiNext board. That valuation would surpass carmakers Kia Motors, Mazda Motor and some its Chinese customers. Rival BYD is valued at about $27 billion. CATL may host a road show later this year. The underwriters include Goldman Sachs and CSC Financial. When completed, the new 24 gigawatt-hour factory will catapult CATL to the top of the manufacturing capacity rankings. Currently, it has 17.5 gigawatt hours a year in capacity either in operation or about to come online. A gigawatt hour is the equivalent of 1 million kilowatt hours of electricity — about enough to power 1 million homes for an hour. The factory will boost that total to 41.5 gigawatt hours, surpassing LG Chem’s production, BNEF said in a November report. By comparison, Tesla’s gigafactory will have a capacity for 35 gigawatt hours.